WB: TE 671, SK N BE and HeLa whole cell lysates. IHC-P: Human tonsil tissue. Flow Cyt: HeLa cells. Our Abpromise guarantee covers the use of ab2175 in the following tested applications. WB Use at an assay dependent concentration. Predicted molecular weight: 32 kDa. IHC-Fr Use at an assay dependent concentration. This antibody may be diluted to a titer of 1/50-1/100 in an ABC method. We suggest an incubation period of 30 minutes at room temperature. ICC/IF Use at an assay dependent concentration. Used at a dilution of 1/300 for 2 hrs on mouse MEF cells (see Abreview for further details). Required for DNA recombination, repair and replication. The activity of RP-A is mediated by single-stranded DNA binding and protein interactions. Functions as component of the alternative replication protein A complex (aRPA). aRPA binds single-stranded DNA and probably plays a role in DNA repair; it does not support chromosomal DNA replication and cell cycle progression through S-phase. 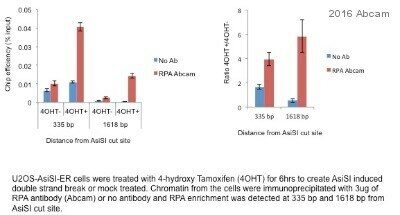 In vitro, aRPA cannot promote efficient priming by DNA polymerase alpha but supports DNA polymerase delta synthesis in the presence of PCNA and replication factor C (RFC), the dual incision/excision reaction of nucleotide excision repair and RAD51-dependent strand exchange. Phosphorylated in a cell-cycle-dependent manner (from the S phase until mitosis). 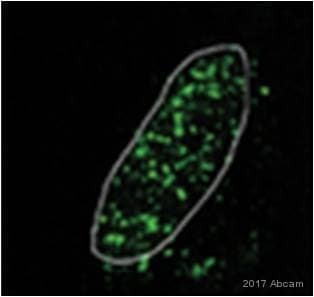 Phosphorylated by ATR upon DNA damage, which promotes its translocation to nuclear foci. Can be phosphorylated in vitro by PRKDC/DNA-PK in the presence of Ku and DNA, and by CDK1. Nucleus. Nucleus > PML body. Also present in PML nuclear bodies. Redistributes to discrete nuclear foci upon DNA damage. ab2175 at 1/200 staining human skin fibroblasts by ICC/IF. The cells were treated with 2mM hydroxyurea for 16 hours, formaldehyde fixed and permeabilized with 0.5% Triton X100. They were then incubated with the primary antibody for 1.5 hours at 37°C. 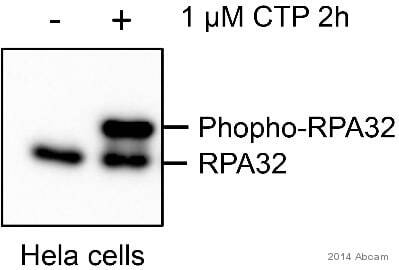 A Cy3® conjugated sheep anti-mouse antibody was used as the secondary. Immunohistochemical analysis of formalin-fixed, paraffin-embedded Human tonsil tissue, staining RPA32/RPA2 with ab2175. Staining was detected using DAB. 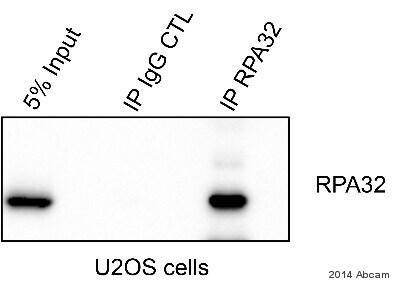 Anti-RPA/32/RPA2 antibody [9H8] (ab2175) is used to measure DNA Double-Stranded Breaks resection in U2OS cells +/- Camptotechin (CPT). ab2175 is used at 1/200 dilution in 1xPBS + 0.2% Triton X-100 for 1 hour at 25°C. 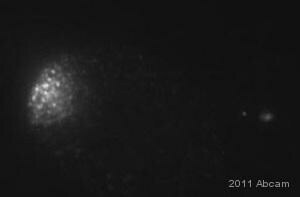 Secondary antibody: anti-mouse Molecular Probes Alexa Fluor® 488 Conjugated at 1/200 dilution. Overlay histogram showing HeLa cells stained with ab2175 (red line). The cells were fixed with 80% methanol (5 min) and then permeabilized with 0.1% PBS-Tween for 20 min. The cells were then incubated in 1x PBS / 10% normal goat serum / 0.3M glycine to block non-specific protein-protein interactions followed by the antibody (ab2175, 1µg/1x106 cells) for 30 min at 22ºC. The secondary antibody used was DyLight® 488 goat anti-mouse IgG (H+L) (ab96879) at 1/500 dilution for 30 min at 22ºC. Isotype control antibody (black line) was mouse IgG1 [ICIGG1] (ab91353, 2µg/1x106 cells) used under the same conditions. Acquisition of >5,000 events was performed.